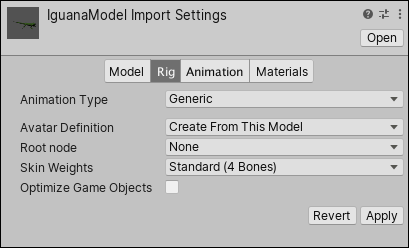 See in Glossary in the imported Model so that you can animate it. For Humanoid characters, this means assigning or creating an Avatar. For non-Humanoid (Generic) characters, this means identifying a Root bone in the skeleton. Animation Type Specfiy the type of animation. Legacy Use the Legacy Animation System. Import and use animations as with Unity version 3.x and earlier. Humanoid Use the Humanoid Animation System if your rig is humanoid (it has two legs, two arms and a head). Unity usually detects the skeleton and maps it to the Avatar correctly. In some cases, you may need to set a change the Avatar Definition and Configure the mapping manually. See in Glossary for a generic model, and blend properly between Animations that have not been authored “in place” (that is, where the whole model moves its world position while animating). Specifying the root node helps Unity determine between movement of the bones relative to each other, and motion of the Root node in the world (controlled from OnAnimatorMove). Avatar Definition Choose where to get the Avatar definition. Copy from Other Avatar Point to an Avatar set up on another model. Root node Select the bone to use as a root node for this Avatar. Only available if the Avatar Definition is set to Create From This Model. Source Copy another Avatar with an identical rig to import its animation clips. Only available if the Avatar Definition is set to Copy from Other Avatar. Optimize Game Object Remove and store the GameObject transform hierarchy of the imported character in the Avatar and Animator component. If enabled, the SkinnedMeshRenderers of the character use the Unity animation system’s internal skeleton, which improves the performance of the animated characters. Enable this option for the final product. Note: In optimized mode, skinned mesh matrix extraction is also multi-threaded. See in Glossary. Unity uses the Avatar to map the simplified humanoid bone structure to the actual bones present in the Model’s skeleton. Configure… Open the Avatar configuration. Generation Select the animation import method. Store in Original Roots (Deprecated) Deprecated. Do not use. Store in Nodes (Deprecated) Deprecated. Do not use. Store in Root (Deprecated) Deprecated. Do not use. 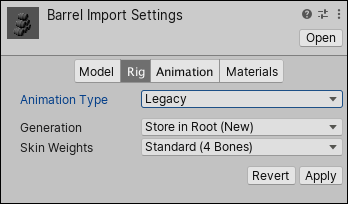 Store in Root (New) Import the animation and store it in the Model’s root node. This is the default setting.